President George H.W. Bush once shaved his head to support a Secret Service agent whose 2-year-old son was diagnosed with cancer. Ahead of Bush’s funeral, the Secret Service shared two pictures showing Bush in 2013 grinning and posing with a bald head, along with the agent, the agent’s son, and other agents. “Everyone’s thoughts are on President Bush & we wanted to share a memory,” the service said on Twitter. Bush was the 41st president of the United States. Bush met with the young boy again several years later, revealing that the boy was doing much better. Bush and the boy posed together in November 2016, both with their hair grown back. “Incredibly thankful that my friend Patrick, the courageous young man (with hair!) to my left, is feeling and doing much better these days,” Bush wrote on Twitter. Bush’s funeral was slated to take place starting at 11 a.m. at the National Cathedral in Washington. Bush died on Nov. 30 at the age of 94. He is survived by five children and their spouses, 17 grandchildren, eight great-grandchildren, and two siblings. President Donald Trump, First Lady Melania Trump, and the bulk of the Bush family were among the expected guests at the funeral. Bush’s son, former President George W. Bush, was among those scheduled to deliver eulogies. After the funeral, the casket Bush senior will be taken to Houston, Texas, for a viewing. Bush will be buried at the George H.W. Bush Presidential Library and Museum after a ceremony at the Texas A&M University on Dec. 6. Dec. 5 was declared a national holiday by President Donald Trump in Bush’s honor. President Trump has praised and honored the elder Bush, arranging for Air Force One to transport Bush’s body to the nation’s Capitol and visiting the casket on Monday night. 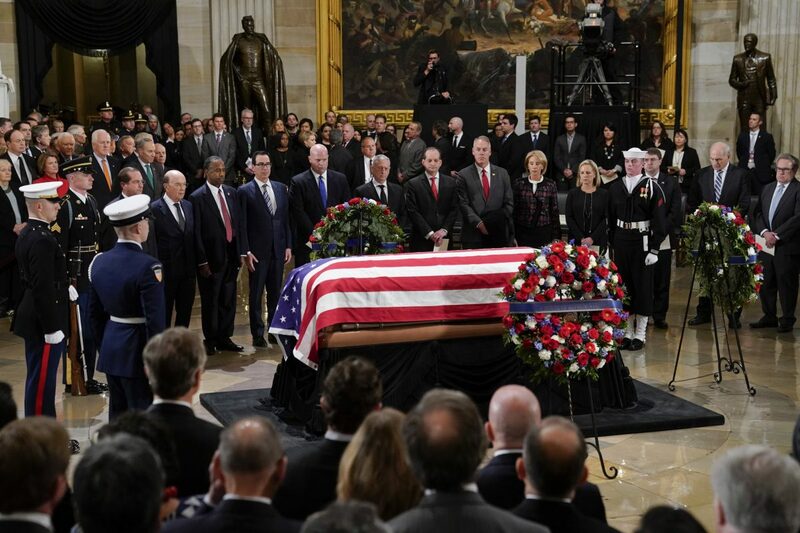 The 45th president and first lady stood in front of the casket with their eyes closed before the Trump saluted the casket and the pair exited the rotunda at the U.S. Capitol. Trump posted a video of the welcoming ceremony on his Twitter feed, and it’s received millions of views. Bush’s body will be taken to the National Cathedral on Wednesday morning by motorcade. Trump ordered federal offices closed on Wednesday for a national day of mourning. “President George H.W. Bush led a life that exemplified what is truly great about America. As with so many of his generation, the Greatest Generation, President Bush worked selflessly throughout his long life to bring about a world of justice and lasting peace. With his passing, we mark one of the last pages of a defining chapter in American history,” he wrote in a statement sent to Congress.